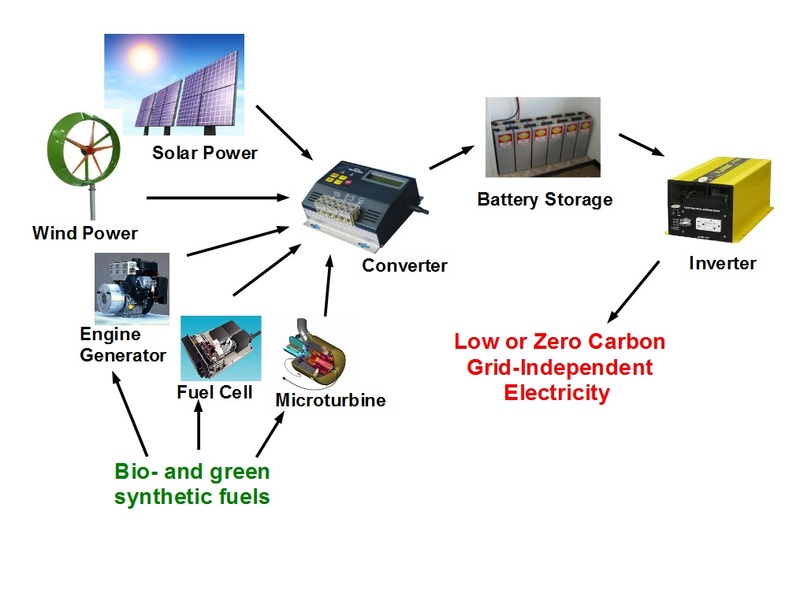 Much like in a hybrid-electric car, the combination of multiple energy sources and energy storage can be very efficient and flexible in power generation. For example, a solar-power system needs electronics to control battery charge, and an inverter to convert DC electricity to AC. A small-engine generator or fuel cell could be added to that system and provide a second power input to the same chain of equipment. In North America and Europe, the central power grid acts as a reliable back-up in periods of peak demand or when renewable production is low. If a cloud crosses the sky or the wind dies down, the small generator could act as a back-up if grid connection is not possible. This adds a great deal of energy capability at little added cost. In areas without a grid or with poor grid reliability, energy storage and/or back-up generation is essential to meet real-time energy demands. If the fuel for back-up generation is inexpensive, green and locally produced, then this approach is much more effective than having a much larger renewable energy system. Copyright © 2016 Ahead Energy. All Rights Reserved.